AT675 5Pcs Floating Buoyancy Ball B..
AT675 5Pcs Floating Buoyancy Ball Bobber Float for GoPro Hero5 Hero4 3 3+/ SJCAM SJ7000 SJ5000/ X..
XIAOMI Yi 16.0MP 1080P Sports Camco..
XIAOMI Yi 16.0MP 1080P Sports Camcorder Action Camera Ambarella A7LS WiFi Bluetooth 4.0 - Green .. 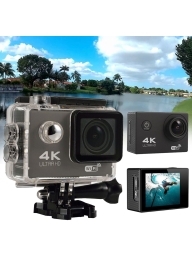 Outdoor Sports DVR Cam Waterproof A.. Outdoor Sports DVR Cam Waterproof Action DV Camera Car Recorder 1080P 1.5 Inch - Black A ..
AT80 Glasses Style Full HD 1080P Sp..
AT80 Glasses Style Full HD 1080P Sports Camcorder DVR DV 5Mega CMOS Sensor Glasses style sports..
VIDVIE 64GB Micro SDXC Card Speed 1..
VIDVIE 64GB Micro SDXC Card Speed 10 Compatible With Smartphones Tablets Cameras PsP Specific..
VIDVIE 32GB Micro SDHC Card Speed 1..
VIDVIE 32GB Micro SDHC Card Speed 10 Compatible With Smartphones Tablets Cameras PsP Specific..
Ultra HD 4K Wi-Fi Sports Action Cam..
Ultra HD 4K Wi-Fi Sports Action Camera 16MP Image 4K Video 2" LCD 170 Degrees Wide Angle Len..
Eken H9R 4K Ultra HD WiFi Action Ca..
Eken H9R 4K Ultra HD WiFi Action Camera 2" LCD 4K Video 20MP Photo 170 Degree Lens with 30m ..
4K Ultra HD DV WiFi Sports Action C..
4K Ultra HD DV WiFi Sports Action Camera 4K Video 16MP Image 170 Degree Lens with 30m Deep Waterp..